Privileged siblings Jason and Diane and their friend Tyler, harbouring an adolescent crush on Diane, had snuck outside to avoid the adult party going on indoors when it happened. Just like that, the sky was black. No stars, no moon, no planets. Nothing. The following day the sun rose on cue but it was not the same; a smoothed-out, blemish-free caricature of its former self, yet thankfully sustaining life all the same. The Earth had become trapped in the Spin and nothing would be the same again. Robert Charles Wilson is renowned as a master of hard scifi yet this was the first of his works I’d read. Wow. Spin is the kind of book that leaves you reeling, sledgehammering idea after idea into your brain until you’re forced to put it down and take a breather. 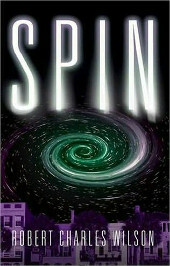 Told from the perspective of Tyler it describes, on the surface, the phenomenon of the Spin and its effects on humanity. After some investigation is transpires that the Earth has been cocooned in a kind of membrane which not only obscures it from outside eyes but also has the effect of massively slowing localised passage of time. A day on Earth now equates to almost a million years in the universe at large. The effects of the massively concentrated amounts of solar energy and cosmic radiation we should be receiving are somehow ameliorated by the Spin membrane itself. So it seems there is no immediate danger, but as we all know this sola system won’t last forever and the sun will eventually become a red dwarf, expanding to devour the inner planets including our own. A fate from which we were previously separated by an unimaginably vast gulf of time now seems to be approaching within a lifetime. Against this background, Wilson begins a masterful examination of human nature, persistence and our place in the universe. The concepts raised along the way are as exhilarating as they are mind-bending. For example, given that Earth’s scientific community has a mere few decades in which to attempt a solution to a seemingly insurmountable problem, what could they possibly do? Well, why not outsource the problem? By seeding Mars with the ingredients necessary for life, and eventually with human volunteers, then our new Martian neighbours could not only observe the Spin from the outside at a normal galactic pace and eventually return their findings to us. A year passing in Earth time would equate to over a hundred million years of Martian progress and evolution. This should give some idea of the kind of scale Wilson toys with in Spin. However, at its heart Spin is essentially a very human love story spanning a whole generation. Tyler’s distant yearning for Diane, eternally beyond his reach, plays out in parallel with an intelligent discourse on the relationship between science and faith. Also falling into the ‘human interest’ category is the conflict between the gifted Jason and his overbearing father E.D., not only a study on the age-old idea of youth forever struggling to break free of parental chains but also a comment on the destructive nature of conservatism and authority. As I mentioned before, at times it’s hard to keep going with a book this densely crammed full of information and speculation. Fortunately Robert Charles Wilson is a gifted enough writer that the story manages to keep flowing and never crushes you under the weight of its ambition. By the time the incredible climax arrives you should be happily keeping pace with events and will almost certainly wish he’d kept going for another four hundred pages. And on that note I’m off to seek out more of his works.